In contrast, the Open Philanthropy Project’s work on global catastrophic risks focuses on both potential outright extinction events and global catastrophes that, while not threatening direct extinction, could have deaths amounting to a significant fraction of the world’s population or cause global disruptions far outside the range of historical experience. This post explains why I believe this approach is appropriate even when accepting (a) from the previous paragraph, i.e., when assigning overwhelming moral importance to the question of whether civilization eventually realizes a substantial fraction of its long-run potential. While it focuses on my own views, these views are broadly shared by several others who focus on global catastrophic risk reduction at the Open Philanthropy Project, and have informed the approach we’re taking. Civilization’s progress over the last few centuries—in scientific, technological, and social domains—has no historical parallel. With the possible exception of advanced artificial intelligence, for every potential global catastrophic risk I am aware of, I believe that the probability of an outright extinction event is much smaller than the probability of other global catastrophes. My understanding is that most people who favor focusing work almost entirely on outright extinction events would agree with this. If a global catastrophe occurs, I believe there is some (highly uncertain) probability that civilization would not fully recover (though I would also guess that recovery is significantly more likely than not). This seems possible to me for the general and non-specific reason that the mechanisms of civilizational progress are not understood and there is essentially no historical precedent for events severe enough to kill a substantial fraction of the world’s population. I also think that there are more specific reasons to believe that an extreme catastrophe could degrade the culture and institutions necessary for scientific and social progress, and/or upset a relatively favorable geopolitical situation. This could result in increased and extended exposure to other global catastrophic risks, an advanced civilization with a flawed realization of human values, failure to realize other “global upside possibilities,” and/or other issues. Consequently, for almost every potential global catastrophic risk I am aware of, I believe that total risk (in terms of failing to reach a substantial fraction of humanity’s long-run potential) from events that could kill a substantial fraction of the world’s population is at least in the same ballpark as the total risk to the future of humanity from potential outright extinction events. Therefore, when it comes to risks such as pandemics, nuclear weapons, geoengineering, or geomagnetic storms, there is no clear case for focusing on preventing potential outright extinction events to the exclusion of preventing other global catastrophic risks. This argument seems most debatable in the case of potential risks from advanced artificial intelligence, and we plan to discuss that further in the future. Minimize expected deaths: Seek a strategy for mitigating and/or adapting to risks of catastrophic events that minimizes expected deaths. Throughout this post, I focus on the latter. Level 1 event: A continuous chain of events involving the deaths of hundreds of millions of people, such as an extreme pandemic. Level 2 event: A continuous chain of events involving the extinction of humanity, such as a pandemic engineered to kill 100% of the world’s population. Some events do not sort neatly between the two categories, but that will not be important for the purposes of this discussion. In making this distinction, I have avoided using the terms “global catastrophic risk” and “existential risk” because they are sometimes used in different ways, and what counts as a “global catastrophic risk” or an “existential risk” depends on long-term consequences of events that are very hard to predict. For example, the Open Philanthropy Project defines “global catastrophic risks” as “risks that could be bad enough to change the very long-term trajectory of humanity in a less favorable direction (e.g. ranging from a dramatic slowdown in the improvement of global standards of living to the end of industrial civilization or human extinction),” some other people who professionally work on existential risk often use the term “global catastrophic risk” to refer to events that kill a substantial fraction of the world’s population but do not result in extinction, reserving the term “existential risk” for events that would directly result in extinction (or have other, more obvious long-term consequences). But the more formal definition of “existential risk” is a risk that “threatens the premature extinction of Earth-originating intelligent life or the permanent and drastic destruction of its potential for desirable future development.” That definition is neutral on the question of whether level 1 events are existential risks. A major purpose of this post is to explore the possibility that level 1 events are existential risks. Level 2 focus: In order to maximize long-term potential, a catastrophic risk reduction strategy should be almost exclusively focused on preventing/preparing for level 2 events. Dual focus: In order to maximize long-term potential, a catastrophic risk reduction strategy should seek to prevent/prepare for both level 1 and level 2 events. The threat to humanity’s future potential from level 1 events is not small in comparison with the threat from level 2 events. One reason AI may be the most urgent existential risk is that it’s more likely for AI (compared to other sources of catastrophic risk) to be a full-blown existential catastrophe (as opposed to a merely billions dead catastrophe). Humans are smart and adaptable; we are already set up for a species-preserving number of humans to survive (e.g. in underground bunkers with stockpiled food, water, and medicine) major catastrophes from nuclear war, superviruses, supervolcano eruption, and many cases of asteroid impact or nanotechnological ecophagy. Machine superintelligences, however, could intelligently seek out and neutralize humans which they (correctly) recognize as threats to the maximal realization of their goals. Because level 1 events are generally seen as substantially more likely than level 2 events, it may be much easier to get broad support for efforts to reduce risks from level 1 events. It might be argued that level 1 events are easier to think about and develop appropriate societal responses for. Uncertainty about whether the “maximize long-term potential” heuristic is correct might speak in favor of a dual focus approach. However, this post focuses on the implications of level 1 events for long-term potential independently of these considerations. The core of the argument is that there is some (highly uncertain) probability that civilization would not fully recover from a level 1 event, and—with the possible exception of AI—that the probability of level 1 events is much greater than the probability of level 2 events. I would guess that when we multiply these probabilities through, the total risk to humanity from level 1 events is in the same rough ballpark as the total risk from level 2 events (again, bracketing risks from AI). If I and others at the Open Philanthropy Project changed our view on this, we might substantially change the way we’re approaching global catastrophic risks. A pandemic—whether natural or engineered—seems much more likely to be a level 1 event than a level 2 event. Nuclear conflict causing extreme disruption to global civilization (a level 1 event) seems much more likely than extinction in nuclear winter following a total nuclear exchange between the U.S. and Russia (a level 2 event). Most debatably, purposeful misuse of advanced artificial intelligence (a level 1 event or perhaps a negative trajectory change) is arguably more likely than extinction following the creation of an extremely powerful agent with misaligned values (a level 2 event). We plan to write more about this in the future. Perhaps climate change could cause extinction for unknown reasons, but the risk of extreme global disruption short of extinction looks much higher. Perhaps geoengineering could result in the extinction of humanity, but extreme global disruption short of extinction again seems much more likely. This section argues that civilization has had unusually rapid progress over the last few hundred years, that the mechanisms of this progress are poorly understood, that we have essentially no experience with level 1 events, and that there is a risk that civilization will not fully recover if a level 1 event occurs. 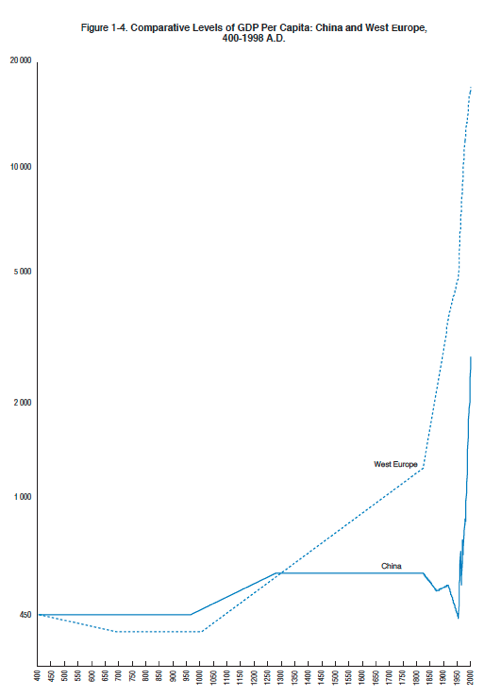 The groundwork for this revolution was laid by advances in previous centuries, so a “scientific and technological progress” chart wouldn’t look exactly like this “income per person” chart, but I’d guess it would look qualitatively similar (with the upward trajectory beginning somewhat sooner). I am aware of no other period in human history with comparable progress along these dimensions. I believe there is still significant room for improvement along many of these and other dimensions, which is one reason I see it as very important that this kind of progress continues. There is a large literature studying the causes of the Industrial Revolution and the “Great Divergence”—i.e. the process by which some countries leaped ahead of others (some of which later caught up, and some of which may catch up in the future) in terms of wealth and technological capacity. Explanations of this phenomenon have appealed to a variety of factors, as can be seen from this overview of recent work in economic history on this topic. My understanding is that there is no consensus about which of these factors played an essential role, or even that all potentially essential factors have been identified. [M]any aspects of the Industrial Revolution were not inevitable, but some extremely general aspects of industrialization (such as humans eventually gaining the ability to use fossil fuels) were essentially inevitable once there was a species capable of transferring substantial amounts of knowledge between people and across generations. There were four “world zones” in history that didn’t interact with each other very much: Afro-Eurasia, the Americas, Australasia, and the Pacific. In Professor Christian’s view, these world zones developed at different rates along similar trajectories (though he emphasized that other historians might dispute this claim). However, Professor Christian also cautioned that his view about the inevitability of technological progress was not generally shared by historians, who are often suspicious of claims of historical inevitability. A necessary ingredient to the Industrial Revolution in Europe was the development of a certain kind of scientific culture. This culture was unusual in terms of (i) its emphasis on experimentation and willingness to question conventional wisdom and authority, (ii) its ambition (illustrated in the thought of Francis Bacon) to find lawlike explanations for natural events, and (iii) its desire to use scientific discoveries to make useful technological advances. If not for this unique cultural transformation in Europe, he argues, other countries would never have developed advanced technologies like digital computers, antibiotics, and nuclear reactors. Though I have not studied the issue deeply, I would guess that there is even less consensus on the inevitability of the social progress described above. It seems that it would be extremely challenging to come to a confident view about the conditions leading to this progress. In the absence of such confidence, it seems possible that a catastrophe of unprecedented severity would disrupt the mechanisms underlying the unique civilizational progress of the last few centuries. For the most part, these events don’t seem to have placed civilizational progress in jeopardy. However, it could be argued that World War II might have had a less favorable ultimate outcome, with potentially significant consequences for long-term trends in social progress. In addition there are very few past cases of events this extreme, and some potential level 1 events could be even more extreme. Moreover, the Black Death—by far the largest catastrophe on the list relative to population size—took place before the especially rapid progress began, so was less eligible to disrupt it. The remaining events on this list seem to have killed under 5% of the world’s population. Thus, past experience can provide little grounds for confidence that the positive trends discussed above would continue in the face of a level 1 event, especially one of unprecedented severity. In this way, our situation seems analogous to the situation of someone who is caring for a sapling, has very limited experience with saplings, has no mechanistic understanding of how saplings work, and wants to ensure that nothing stops the sapling from becoming a great redwood. It would be hard for them to be confident that the sapling’s eventual long-term growth would be unaffected by unprecedented shocks—such as cutting off 40% of its branches or letting it go without water for 20% longer than it ever had before—even taken as given that such shocks wouldn’t directly/immediately result in its death. For similar reasons, it seems hard to be confident that humanity’s eventual long-term progress would be unaffected by a catastrophe that resulted in hundreds of millions of deaths. If I believed that sustained scientific, technical and social progress were inevitable features of the world, I would see a weaker connection between the occurrence of level 1 events and the long-term fate of humanity. If I were confident—for example—that a level 1 event would simply “set back the clock” and let civilization replay itself essentially unchanged—then I might believe it would take something like a level 2 event to change civilization’s long-term trajectory. But the limited room for understanding the causes of progress over the last few centuries and the world’s essentially negligible experience with extreme events do not offer grounds for confidence in that perspective. Specific mechanisms by which a catastrophe could affect the distant futureIn addition to the above general and non-specific reasons to expect that a level 1 event could devastate the future, I can also think of specific mechanisms by which civilizational progress could be disrupted, and mechanisms by which such disruption could be bad for the fate of humanity. Risky stall: Perhaps—during a lengthy stall in scientific progress—some other catastrophe would make humanity go extinct. If the rate of progress were slow enough, even a low background rate of natural extinction events could become important (this background rate would likely fall if civilization developed the capacity for space colonization or created advanced artificial intelligence). But such a catastrophe could also rely on advanced technology because there is a distinction between creating new innovations and using and spreading existing innovations, and the background risk for those events may be much greater. This risk might be especially salient if the initial catastrophe occurred during a period where humanity had significantly more powerful weapons technology, such as the next generation of biological weapons. Alternatively, during this lengthy window of weakness, an authoritarian regime could take root; perhaps advanced technology would make its power permanent, and lead to a flawed realization of the future. Resource depletion and environmental degradation: A lengthy stall in scientific progress may allow enough time to pass that other negative trends—such as the depletion of essential resources or accumulation of climate change over hundreds of years in a world without technological solutions to the problem—could result in a permanent decrease in humanity’s future potential. For example, perhaps civilization could use up essentially all available fossil fuels before finding suitable replacements, potentially making it much more challenging to retrace steps through technological history. Permanent stagnation: If scientific culture or institutions never returned, perhaps civilization would never develop some important technologies, such as those needed for space colonization. As with scientific progress, social progress (in terms of the utilitarian-type value, as discussed above) seems to have been disproportionately concentrated in recent centuries, and its mechanisms remain poorly understood. Negative cultural trajectory: It seems possible that just as some societies reinforce openness, toleration, and equality, other societies might reinforce alternative sets of values. (For example, it is possible – as implied in The Better Angels of Our Nature for example – that the kind of social progress I’m highlighting is connected to scientific culture or institutions, and could be comparably fragile.) Especially if culture continues to become increasingly global, it may become easier for one kind of culture to dominate the world. A culture opposed to open society values, or otherwise problematic for utilitarian-type values, could permanently take root. Or, given certain starting points, cultural development might not inevitably follow an upward path, but instead explore a (from a utilitarian-type perspective) suboptimal region of the space of possible cultures. Even if civilization reaches technological maturity and colonizes the stars, this kind of failure could limit humanity’s long-term potential. Authoritarian regime inhibits scientific progress: A catastrophe could push the world in the direction of control by an authoritarian regime. An authoritarian regime with geopolitical clout analogous to what the U.S. has today could unleash many of the risks discussed above. Reversion toward inter-state violence: A sufficiently extreme catastrophe could threaten the conditions that have to led the historical decline of inter-state violence. During the Cold War, the USSR employed tens of thousands of researchers in a secret biological weapons program. In a world where the trend toward peace were disrupted but technological progress continued, the destructive potential of a such a research program could become much greater. The result could be a later Level 2 event, which might happen more easily if humanity is already in a weakened condition. Irrevocable technological mistakes: Irrevocable technological mistakes might be made by people who lack the necessary wisdom and foresight. This possibility seems more disturbing in a world with fewer highly capable and human-welfare-oriented people and/or less favorable geopolitical conditions, relative to what exists today (today seems favorable on these dimensions by historical standards). For example, it seems to me that the risk of creating a superintelligent artificial intelligence with misaligned values would be significantly heightened if—rather than being created by highly capable scientists in open societies—advanced artificial intelligence were developed by less capable and thoughtful scientists in a violence-prone world under the guidance of an authoritarian regime. Likewise, if humanity pursued advanced forms of genetic enhancement or geoengineering, I would like to see those fraught choices made under the most favorable possible circumstances, and today’s circumstances seem quite favorable relative to historical norms. Potential offsetting factorsSo far my discussion has focused on how a global catastrophe could negatively affect the fate of humanity. Are there any potential mechanisms by which a global catastrophe could make our future seem brighter from the perspective assumed in this post (prioritizing maximal long-term potential, preferably including space colonization)? Warning shots: If civilization survives the level 1 event, perhaps the event will serve as a “warning shot,” and cause society to make more appropriate preparations for level 2 events. Ills of modernity: Perhaps civilizational “progress” is actually negative—for example because of the effects it has on the environment, the way it promotes inequality, the way it has led humans to treat animals, or the way it has stamped out traditional cultures and values. If it were disrupted, perhaps that would be a good thing. More preparation for critical technological junctures: Perhaps a catastrophe would set back industrial capacity and development, but would not set back scientific and social progress by as great a factor. This might mean that when humanity reaches critical junctures of technological development—such as advanced artificial intelligence, powerful genetic enhancement, or atomically precise manufacturing—civilization will be more mature, and more ready to handle the subsequent challenges. I want to acknowledge these possible objections to our line of reasoning, but do not plan to discuss them deeply. My considered judgment—which would be challenging to formally justify and I acknowledge I have not fully explained here—is that these factors do not outweigh the factors pushing in the opposite direction. Overspecificity of reactions to warning shots: It may be true that, e.g., the 1918 flu pandemic served as a warning shot for more devastating pandemics that happened in the future. For example, it frequently gets invoked in support of arguments for enhancing biosecurity. But it seems significantly less true that the 1918 flu pandemic served as a warning shot for risks from nuclear weapons, and it is not clear that the situation would change if one were talking about a pandemic more severe than the 1918 flu pandemic. If a level 1 event carries many of the risks discussed above, it would seem to be an extremely high price to pay for increasing society’s willingness to prepare for a level 2 event of the same type. Better solutions to the ills of modernity: Though I would agree that civilizational progress has brought problems as well as improvements, my opinion is that it is firmly on the positive side of the ledger on net. Moreover, correcting many of the problems of civilization seems possible at costs much lower than allowing a level 1 event to occur. Less preparation for critical technological junctures: I believe it is very challenging to prepare for critical technological junctures like creating advanced artificial intelligence decades prior to the arrival of the technology, both because it is hard to know what kind of work will be needed and hard to know what kind of work will not be done. I would guess that much of the preparation will become much easier as the technologies draw closer in time. By contrast, the characteristics of the people and institutions responsible for dealing with these challenges seem robustly important. It therefore seems to me that there is more room for the factors discussed under “irrevocable technological mistakes” to lead to heightened risk than for pushing back technological progress to lead to decreased risk. Events with hundreds of millions of deaths are much more probable than direct extinction events. These events could potentially derail civilizational progress (either temporarily or permanently) and thereby prevent humanity from realizing its full potential. Since these less extreme catastrophes are also much more probable than direct extinction events, preparing for them seems in the same rough ballpark of importance as preparing for direct extinction events. The mechanisms of civilization’s progress are poorly understood, and there are essentially no precedent shocks of the size we are seeking to prevent. I see no way to rule out the possibility that an event with hundreds of millions of deaths would affect the ultimate fate of humanity. As such, I believe that a “dual focus” approach to global catastrophic risk mitigation is appropriate, even when making the operating assumptions of this post (a focus on long-term potential of humanity from a utilitarian-type perspective). Advanced artificial intelligence seems like the most plausible area where an outright extinction event (e.g. due to an extremely powerful agent with misaligned values) may be comparably likely to a less extreme global catastrophe (e.g. due to the use of extremely powerful artificial intelligence to disrupt geopolitics). We plan to discuss this issue further in the future. Thanks to the following people for reviewing a draft of this post and providing thoughtful feedback (this of course does not mean they agree with the post or are responsible for its content): Alexander Berger, Nick Bostrom, Paul Christiano, Owen Cotton-Barratt, Daniel Dewey, Eric Drexler, Holden Karnofsky, Howie Lempel, Luke Muehlhauser, Toby Ord, Anders Sandberg, Carl Shulman, and Helen Toner. I appreciate and agree with the thrust of the post that GCRs which do not directly cause extinction have potential to lead to permanent harms through many of the mechanisms you mentioned, and that in aggregate the expectation of such harms is often in the same ballpark as the expected harm from a level 2 version of the same kind of event. There are distinct questions about marginal impacts vs total impacts, however. Specifically, the heuristic that the relevant institutions mostly don’t give extra priority to level 2 events in accordance with their long-run impact (often to the point of having almost no scientific literature, e.g. for nuclear winter or the very most extreme climate change scenarios), and so there may be neglected opportunities in specifically reducing the level 2 components, and in attending to varying level 2 components of different risks. For AI, one needs to distinguish between human extinction and the extinction of technological civilization. Conditional on catastrophic AI risk, the former seems substantially more likely than the latter. The potential for long-run drastic reduction of value (beyond that in a GCR killing 99% of humans) would come not from human extinction, but from an AI civilization much less normatively valuable than an alternative one might have been, or that also fails to survive. This post was primarily focused on the importance of level 1 events in comparison with level 2 events, and not with their comparative neglectedness. My sense is that when arguments have been made in favor of focusing on level 2 events to the exclusion of level 1 events, those arguments have been primarily based on comparative importance rather than comparative neglectedness. 1. Both loss of control of advanced AI agents and the possibility of governments or other actors using advanced AI as weapons/tools of oppression receive very limited attention. 2. There is essentially no discussion of level 2 natural pandemics, but that seems reasonable given their exceedingly low probability. 3. There is much less work on engineered pandemics than natural pandemics, and engineered pandemics are substantially more level-2-loaded than natural pandemics. However, insofar as there are risks of level 2 engineered pandemics, I would strongly guess that the risks of level 1 engineered pandemics are substantially greater, and both levels of engineered pandemic risk receive very limited attention in any case. 4. All aspects of potential risks from atomically precise manufacturing receive extremely limited attention. 5. Both level 1 and level 2 aspects of geoengineering receive very limited attention, though it’s true that I am not aware of any discussion of outright extinction scenarios involving geoengineering, suggesting a difference in terms of neglect in that case. 6. I am not aware of any attention to level 2 geomagnetic storms, but there is also essentially no risk of a level 2 geomagnetic storm. 7. It does seem that there is limited discussion of nuclear winter in comparison with other aspects of nuclear weapons policy. To prevent potentially-level-2 nuclear winter, the primary objective would likely be to address the risk of a U.S./Russia nuclear war. This is not the area of nuclear weapons policy that seems to receive the most attention today; my casual impression is that nuclear weapons policy issues related to Iran and South Asia receive more attention. However, U.S./Russia issues continue to receive substantial attention from governments and philanthropists. The case where your point seems most true to me is the possibility of building disaster shelters in order to increase the probability of humanity recovering from what would otherwise be an extinction scenario. In my prior work on this subject, I concluded that there was relatively limited potential for additional efforts to increase the probability of recovery given a would-be extinction event. In sum, while your heuristic carries some weight a priori, it does not seem to be substantially borne out upon detailed investigation of candidate level 2 risks. Nick, all good points. In particular, I agree that the heuristic would give only one multiplicative factor when there are a number of such factors in play, e.g. refuges being favored by this but well-funded for other reasons. The 1918 flu was not a global coordination problem, whereas other GCRs seem likely to depend on global coordination efforts. A level 1 event that occurred due to a lack of coordination seems more likely to inoculate society against future coordination challenges. First of all, very interesting and important piece of research. This point doesn’t give consideration to the possibility that the extra preparation time in fact improves the characteristics of the people and institutions involved. Given the observations in Better Angels the situation could quite plausibly be better although of course a level 1 event would complicate the situation in the many ways you discuss. Those who make the (debatable) assumption that social and institutional progress will likely not be far enough when technologies like AI or molecular manufacturing come around may even consider a level 1 event to be the only path to a positive outcome by buying more time. In the best case we may get another few hundred years where infrastructure is re-built etc. and societal progress may be as pronounced as over the past few hundred years (though seems is fairly optimistic). Colin, my point regarding the Black Death is that you can’t argue that because the Black Death didn’t disrupt rapid civilizational progress, other events of that severity couldn’t disrupt it either. I’m saying that argument doesn’t work because rapid civilizational progress had not yet begun. Another way of putting it is that we may be in a different regime now, so that it’s hard to draw lessons from the Black Death about what the Black Death-like events would do today. I think that point holds even if the Black Death promoted social progress. SoerenMindermann, I’m not sure I share your intuition that a level 1 event which occurred due to lack of coordination would be more likely to inoculate society against future coordination challenges. My intuition is once again that any inoculation is issue-specific. I would guess that coordination failures have played a major role in many devastating wars. But it seems unlikely that these wars substantially inoculated society against coordination challenges related to, e.g., climate change. Nick, agreed the Black Death was over six centuries ago, when many things were very different, in particular rates of technological and social change. My point wasn’t intended as a rebuttal of your general thesis or anything, really just clarifying that for the Black Death example (at least as usually understood), it’s longer term effect was surprisingly one of promoting not disrupting civilizational progress. The WWI example is an interesting one. It was not on a “Level 1” scale, but nonetheless it had immense effects. Innumerable scientists were killed in WWI, e.g. Henry Moseley, often described as the greatest experimental physicist at the time. World trade by some measures didn’t recover to pre-WWI levels until IIRC the 1990’s. Indeed, your other examples — the 1918 flu epidemic and WWII — were arguably caused or exacerbated by WWI. I think a general point illustrated by the WWI example is that crises tend to cluster. When we think about some GCR in the abstract, we tend to think of it in isolation. But in the real world, e.g. an environmental crisis can lead to warfare or vice versa; the risks interact. Good on you, Colin Rust. Satisfactory explanations of disaster causation are tough, no question. What has caused the crisis of Syrian refugees? Among the causes, I would say, are important environmental and demographic forces, most especially brutal changes in Midddle Eastern weather (and maybe climate) and the inherently unstable consequences of having giant bulges of teenagers and young adults in societies with insufficient opportunities for upward mobility. Young males in particular.